Clear Muscle - Does Clear Muscle Work to Build Muscle? For those of you who take the pursuit of the ultimate human body as a prime goal in life then nothing is more important to you than maximizing the full benefits that you gain from each and every workout session, recovery period and everything else you do as you work toward the most worthy achievement of attaining a god-like physique. This includes everything from the dietary choices you make to the supplements you should be taking to help you body's system perform at the very highest levels possible. Still, even though many of the other decisions you make regarding training may be easy to make given that so many of the best methods and practices are so well established, when it comes to the choice of supplements things can become far more complicated. Yes, over the last several decades there have been many disputes as to how to best boost the processes of the body in order to get every single ounce of benefit from the incredible amount of work that you do in your pursuits and no one needs to tell you about the serious health concerns associated with the use of anabolic steroid use not to mention the risks and penalties that go along with their use. That's why, in the wake of all the problems with steroid use, there was such a great increase in the creation and marketing of bodybuilding supplements. After all, with an ever increasing market for such products everyone with a lab or access to one wanted to concoct some kind of mixture that would allow them to jump on the bandwagon. So, now because of so many options and all the slick marketing campaigns for bodybuilding supplements, it is harder than ever to know which supplement could be right for you. Because of all the confusion surrounding bodybuilding supplements we, in our ongoing efforts to help our readers, have decided to take a long hard look at one of the most talked about supplements available today - it's called Clear Muscle. 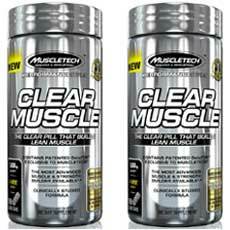 Clear Muscle is a bodybuilding supplement created and distributed by MuscleTech. Although there is no official website for this product that we could find in a standard search of the internet a fair amount of key information can be found through the multiple online retail outlets that offer Clear Muscle including Amazon, GNC, Wal-Mart and others. The main selling point of this product is its formulation which is claims the following: "Clear Muscle is a new, revolutionary muscle building formula powered by BetaTOR, a novel, never-before-produced metabolite and free acid derivative of leucine and HMB. This one-of-a-kind compound unlocks the true potential of HMB for unprecedented bioavailability, effectiveness, and results. BetaTOR works to dramatically amplify protein synthesis through the mTOR pathway while simultaneously fighting catabolism by inhibiting the UPP pathway. This puts the body into the perfect state to build muscle like never before. There is no other supplement like this, and it is exclusively available to MuscleTech® in a clear liquid pill." These are, indeed, some bold claims and the company does support them with further claims related to clinical studies performed by the University of Tampa in which participants were divided into two groups - one receiving Clear Muscle and the other a placebo. Over the twelve week duration of the study the participants using Clear Muscle gained an average of 16 pounds of lean muscle mass while the participants who were given the placebo gained only 4.6 pounds of lean muscle mass. They key benefit of using BetaTOR also known as Free Acid Beta-Methyl butyrate as the only active ingredient in Clear Muscle is that it is claimed to be able to enter the user's bloodstream at a much faster rate than other formulas because of its unique chemical composition and the way it interacts with the body's chemistry. As any experienced consumer understands, the producers of products often use favorable user reviews as a marketing tool on their official websites and other retail outlets. In the case of Muscle Clear, where we could not find an official website, this paradigm remains true with regard to their affiliated retail outlets. This holding true, we decided to do a search of other industry websites and chat rooms dedicated to the subject which had no known affiliation with MuscleTech or Muscle Clear. What we found was that the vast majority of these independent user reviews had a negative view of their experience with Muscle Clear. The most prominent comments dealt with the opinion that these users did not feel that the product lived up to the claims put forth by the company. Although there are no specific indications that Muscle Clear has had any serious complaints related to serious or unwanted side effects it is always advisable to consult with a primary care physician or other qualified medical profession before beginning use of this or any other bodybuilding supplement of a similar nature. The average cost of a bottle of Muscle Clear capsules that we could find is $69.99 and contains 84 servings of 2 capsules. The recommended dosage is three servings per day - morning, afternoon and evening on days in which workout sessions are scheduled. As we talked about that the beginning of this review, for those who are in serious pursuit of the ultimate in human physique there is nothing more important than to squeeze the maximum benefit out of each and every effort that you make whether it be in your workout sessions, your recovery periods, your dietary choices or the supplements you choose to take. And, since the science surrounding most of the choices, although constantly evolving, is well-established the biggest question facing many of the most serious bodybuilders is which supplements are right for them. When it comes to our evaluation of Clear Muscle there are a few things that become evident. The first is that, although the product has a solid list of ingredients similar in nature to many of the leading brands of bodybuilding supplements, it's focus on BetaTOR as the sole active ingredient for the purpose of speeding the absorption into the bloodstream does not provide the type of supporting evidence many believe to be necessary to justify those claims. Another thing that is evident is that the vast majority of independent user reviews that we could find on websites and chat rooms unrelated to any known affiliates of Muscle Clear were not satisfied with the results they achieved compared to the claims set forth by the products producers and found on affiliated retail outlets. Add to that the higher than average cost to complete the extensive recommended plan period and what you end up with is a product that is difficult to rank as one of the top bodybuilding supplement programs available today. For more information regarding the highest quality, top-tier bodybuilding supplements available on the market today, click here.